Kids’ clubs – the saviour of holidaying parents everywhere. Whether your offspring are at the crawling stage or the sneering stage, there’s a club out there to suit. We’ll help you find it. If you don’t discover the joys of a good kids’ club early on, you may miss out on some truly memorable family holidays. Sure, there may be times when you can’t wait to hand them over and occasions when you prefer to spend precious holiday time actually in their company – but isn’t it great to know there’s a choice? In no particular order, here are Australian Traveller’s pick of the kids’ clubs. No need to call the RSPCA – there isn’t a clapped-out old bear in sight at the brand new Cirque Espace, Novotel Twin Waters’ Cirque du Soleil-inspired circus school. The 4.5 star resort on Queensland’s Sunshine Coast beachfront (1800 072 277 or www.twinwatersresort.com.au) has always gone out of its way to make kids happy with its excellent Club Dolfi – and now there’s the added element for anyone aged seven and up (ie, you can do it, too) in the form of the Exhiler8 Flying Trapeze, a static trapeze, juggling, acrobatic balancing . . . it’s a tumbling, clowning free-for-all. Open daily, Club Dolfi also has a new games and play area, meaning kids aged anywhere from two to 12 can check in for activities such as painting, jewellery making, sand sculptures, movie and popcorn nights, discos, puppet and clay design, kite flying – all along the resort’s private, enclosed lagoon beach. While your kids will expect you to put your hand in your pocket for them until the day you die, Club Dolfi offers a brief respite – for each full-priced session your darlings attend, they receive one Dolfi dollar to spend on Dolfi merchandise. A nanny service for children under two years is also available on request. The first resort of its kind in Australia, Hyatt Regency Coolum (http://coolum.regency.hyatt.com or coolum@hyatt.com.au) has an enviable reputation as a laid-back place for active families. Set in 150 hectares surrounded by native bush and with two kilometres of surf beach, Coolum has its own championship golf course, no less than nine swimming pools, a tennis club, health and fitness centre and the Sun Spa (where you could easily spend much of your holiday), plus Camp Hyatt for kids. Great news for new parents, Camp Hyatt caters for all ages, with a Possums Club for infants aged six weeks to two years offering three-hour sessions (time for you to have a hit of tennis or a round of golf or something very, very soothing at the Sun Spa). The Joeys Club takes kids from two to five years, and the Kookaburras Club is for five to 12 years, while eight to 12-year-olds have four-hour sessions at the Wallabies Club during school holidays. Camp Hyatt activities include arts and crafts, music, story-telling, kite-flying, archery, swimming, beach activities, adventure playground, canoeing and theme days, while all sessions include snacks and light meals, subject to parent’s approval. Shh! Don’t tell the kids . . .
. . . but Couran Cove Island Resort off the Queensland Gold Coast (www.courancove.com.au) is only 40 minutes from theme parks such as Dreamworld, Wet ‘n’ Wild and Movieworld. The island itself has many different styles of accommodation, including two-bedroom waterfront lodges, four-bedroom villas on the Broadwater or in the Forest setting, 2.5-bedroom nature cabins for self-catering, and waterfront hotel rooms and suites – so check to make sure which will suit you best. Guests bike around this spacious resort or take the tram. The Kites Kids’ Club is an activities centre for children aged three to 12 and is run by trained coordinators who supervise highly entertaining pastimes such as frog and crab spotting expeditions, treasure hunts, pipi gathering, kayaking, boat making, sand castle competitions and even a mini Olympics. A clown school, arts and crafts, T-shirt painting and special theme nights are just some of the other activities – as well as something called “mud madness” which I don’t want to ask any more about (it probably involves laundry – but what the heck, that’s as good an excuse as any to book yourself an additional spa treatment). Costs are from $18 for morning and afternoon sessions and $30 for an evening session, including Spa Island dinner. There’s also a babysitting service. Pack only the essential toys your child won’t leave home without when you visit the Novotel Pacific Bay Resort in Coffs Harbour, NSW (1300 363 360), as toys for babies and toddlers can be hired for ten dollars a bag. Babysitting is also available, as well as supervised trips to the movies and Hungry Jacks in school holidays. Package stays are available at this resort overlooking Charlesworth Bay, and up to December 24 a family can stay in a one-bedroom suite from $231 a night, with a free activities pass thrown in. Since this is a Novotel, kids aged two to 15 can avail themselves of Club Dolfi and all its attendant delights – programs for making Shrek hats and jungle masks, painting sea collages, that sort of thing – and be kept generally entertained while you’re off taking care of the washing and cooking (all spa suites feature a full kitchen and laundry). Or perhaps you’re off relaxing in your spa bath. Either way, once those chores are done you might be found by or in one of the three swimming pools, playing a round of golf or having a treatment at the day spa. Music, games and video nights are also available for the kids. Nearby, see the Wallabies training facilities, the Big Banana and other family attractions. Beach life, rainforest and even a farm to explore are all drawcards at Dunk Island, a long-time family favourite now under the Voyages umbrella (www.voyages.com.au or www.dunk-island.com). Dunk is a tropical rainforest island with average temperatures during summer school holidays of around 30°C. Obviously you can expect some rain, since it’s the Wet season and Dunk is well into the tropics – but the island’s kids’ club is too well regarded to leave out of this list. 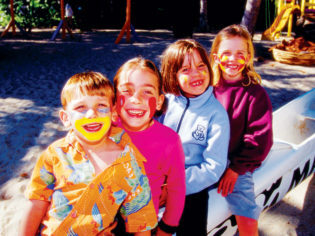 It caters for children aged three to 12 all year round, with a Keen Teens program operating during school holidays. Activities include rainforest discovery walks, turtle spotting, arts and crafts based around the nature of the island, disco parties, stargazing, night walks, movies, night games and kids’ dinners. There are visits to the island’s farm, Coonanglebah, snorkelling lessons, indoor and outdoor tennis, a children’s playground, nature and history walks. For big kids (up to and including you) there’s an 18-hole golf course, kayaks, catamarans, paddle skis and sailboards, plus fishing charters, horse riding on the beach, Great Barrier Reef dives and Jet Ski guided island tours. Oh, nearly forgot – the Dunk Island kids’ club also has its own meal times and activities, so you can plan to slip away on that sunset cruise . . .
You’ll love the Whitsundays’ Club Med Lindeman Island, with its purpose-built kids’ club featuring all kinds of activities for two to 17-year-olds, offering everything from golf, sailing and tennis to the flying trapeze, rollerblading, set-designing, storytelling and nature walks. Club Med puts a great deal of emphasis on children: Petit Club covers two to three-year-olds; Mini Club takes fours to tens; and Juniors Club Med caters for 11 to 17-year-olds. Younger children go on nature walks, play outdoor games and have tea as a group. In the evenings, there are singsongs and storytelling. Juniors Club Med (11 to 13) are supervised through a wide range of sports and arts activities and have their own meeting places and reserved tables in the restaurants. For the 14 to 17-year-olds, rollerblading, climbing, learning to sail a catamaran and perfecting the flying trapeze are just some of the things on offer. Or how about something artistic like design, themed decoration, making costumes, and stage lighting? As with Dunk Island, you’ve got to figure on some rain in the summer hols – but again, this kids’ club is just too good to leave out. Up in the NSW Blue Mountains at Leura, Peppers Fairmont Resort ( 4784 4144 or www.peppers.com.au) might be best known to you as a golf resort. However, with six different types of rooms designed (and refurbished in 2004), families as well as couples are well catered for. The Bunyip Club is available during school holidays, and child minding can be arranged to give you evenings to yourself – as well as some daytime hours. What will your kids be doing? Most likely making collages based on local bush themes, playing tennis, canoeing, crafting beaded jewellery or playing indoor games. They might also be found engaged in games of table tennis or chess, tackling an obstacle course, on a mystery treasure hunt, or quietly (yes, quietly) painting or making cards. Also great favourites with the kids are swimming, pool games, water aerobics, bush walks, soccer games, volleyball, Bunyip Club nights and big screen family movies. I (almost) wished I were a kid again when I first saw the fun they were having on the Heron Island Junior Ranger Program (www.voyages.com.au). Heron is a coral cay actually on the Great Barrier Reef and, as part of the Marine National Park, it’s of course surrounded by an ocean filled with bright fish, is aflutter with thousands of noddy terns (watch your head), and hosts turtle-nesting season from November to April. The island just barely makes it into the tropics, so it’s not really subject to a rigid Wet and Dry season. Kids aged seven to 12 can join the Junior Ranger Program during Australian eastern seaboard school holidays (and at other times by request, minimum of three), with activities designed to earn them 15 colourful badges. During turtle season they become part of the Queensland Turtle Research monitoring program, with activities including reef walks and snorkelling, turtle tagging, charting the night sky and “piloting” a helicopter. Registration fee is AUD$55, which helps to raise funds for the Queensland Turtle Conservation Program, while also covering the cost of Junior Ranger activities, workbooks and badges. You can swim straight off the beach to the coral and take snorkel and dive trips to some sensational spots. All meals are included in the tariff and the atmosphere is very laid-back – but with enough nightlife to keep parents happy, too. Don’t fancy being squished into one room? The two- and three-bedroom resort cottages at Rafferty’s Resort beside Lake Macquarie (www.raffertysresort.com.au) sleep up to six. A home from home, they’re designed for families (and/or friends), with large living areas complete with TV/Foxtel, gourmet kitchen, courtyard and a veranda, with all the resort facilities on the doorstep. Along with the children’s playground, there’s Rafferty’s Rascals Kids Club for ages four to 12, which operates at weekends and during school holidays. There are four grass tennis courts (two floodlit) and four swimming pools with one indoor, heated and with a spa. 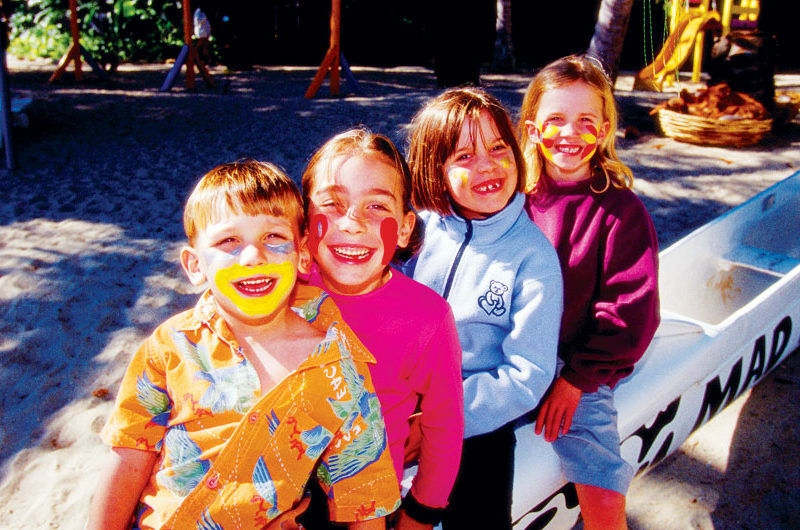 Lakeside beach games such as volleyball help keep kids amused, along with all kinds of other activities on, in and around the lake and property grounds. The resort also has a general store on the property with – importantly – wine sales.